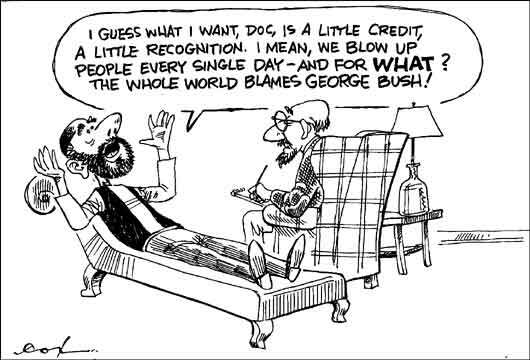 Zarqawi and his therapist. Via No Pasaran! a French blog I recommend. Click on the cartoon for a larger version. For a nation to be sovereign it has to defend its borders. Canada is a very large country, but it hasn't been protecting its vast northern territory. The US announced that one of our submarines went to the North Pole from Alaska then traveled east to the Atlantic Coast. The most likely route would go through waters Canada considers to be their territory, though the channels are so wide that other nations consider them to be international waters. Covered by the National Post - Map But, more importantly, Canada doesn't know where and when the USS Charlotte went. Canada does not patrol the northern area. You would think that they have some listening posts or something. I suppose they would keep quiet about it. But I see that Canada has cut their military so much that they don't have much. I don't recall where I saw it, but Canada has cut its military spending by 25% and its personnel by 25% as well. And the article quotes the past commander of Canadian armed forces for the north that there are seldom any patrols up there. I know one thing they are doing instead. On our early November trip to the Caribbean we saw a Canadian Navy ship at port in Nassau, Bahamas. Prof. Byers said potentially lucrative oil and gas resources off the Queen Elizabeth Islands could slip out of Canadian control if foreign navies are operating in the Arctic without our permission. "The fact of the matter is that we've spent nothing on Arctic sovereignty over the past 20 years." There is a brief mention at PeakTalk. And Red Tory doesn't think there is anything Canada should want to defend. But Canada has defended one tiny island. Hans Island is more than 80 degrees north in the channel between Canda's Ellesmere Island and Greenland. Last July Canada's defense minister traveled there to renew Canada's claim to it in a dispute with Denmark. Denmark protests that the two countries have agreed to disagree over the island - to work it out later. 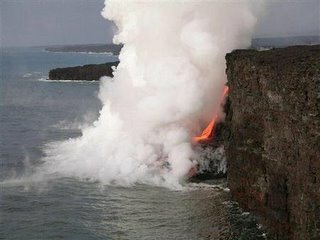 Why they defend one little island while they do nothing to vast stretches baffles me. If you don't protect it you should expect to lose it. The future of America - In Iraq! For several weeks, I observed these young officers working behind the scenes to organize the election in Mosul, Iraq's second-largest city. They arranged for the sniffer dogs at the polling stations and security for the ballots right up to the moment Iraqi officials counted them. They arranged the outer ring of U.S. military security, with inner ones of Iraqi soldiers and police at each polling station, even as they were careful to give the Iraqis credit for what they, in fact, were doing. The massive logistical exercise of holding an election in a city of 2.1 million people was further complicated by the fact that the location of many polling stations changed at the last minute to prevent terrorist attacks. Throughout Iraq, young Army and Marine captains have become veritable mayors of micro-regions, meeting with local sheiks, setting up waste-removal programs to employ young men, dealing with complaints about cuts in electricity and so on. They have learned to arbitrate tribal politics, to speak articulately and to sit through endless speeches without losing patience. This is news to me. Read the original source. Again no internet access at the beach. That's OK. We had rain, wind-driven rain and sun! It's great to get away. Then Linus said.... "And there were in the same country shepherds, abiding in the field, keeping watch over their flock by night. And, lo, the angel of the Lord came upon them, and the glory of the Lord shone round about them! And they were sore afraid ... And the angel said unto them, "Fear not! For, behold, I bring you tidings of great joy, which shall be to all my people. For unto you is born this day in the city of David a Saviour, which is Christ, the Lord." "And this shall be a sign unto you: Ye shall find the babe wrapped in swaddling clothes, lying in a manger." And suddenly, there was with the angel a multitude of the Heavenly Host praising God, and saying, "Glory to God in the Highest, and on Earth peace, and good will toward men. That's what Christmas is all about, Charlie Brown." This is news, not opinion. The IMF's action is a victory for the Bush administration, which is counting on the IMF and World Bank to supply a significant portion of the funds needed for Iraq's reconstruction. "This arrangement will underpin economic stability and help lay the foundation for an open and prosperous economy in Iraq," said U.S. Treasury Secretary John W. Snow... IMF loans normally are considered a green light for private investors to start doing business with a country. But Iraq continues to have trouble attracting investments from major Western companies, particularly in its critical oil sector. its underlying theme that terrorists and those who try to defeat them are morally equivalent makes it impossible to endorse. It's hard to believe that Steven Spielberg would find those fighting to stop the terrorists to be as evil as tghe terrorists who plotted to kill the Israli athletes, then hunted and murdered them in cold blood. Oh, I am sure he puts it in much nicer terms. But he does the same thing - he considers those trying to avenge murder to be equivalent to the murderers. Medved's current reviews are at Eye on Entertainment. It's best to listen to the mp3 file, rather than read, because there are audio clips that are missing from the text version. 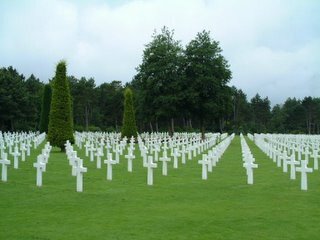 Men who gave their lives to preserve our freedom. The 172.5-acre Normandy American Cemetery has 9,387 burials of US service men and women from World War II. This scene has pleasant Christmas color, but I don't know its location or history. It has been widely reported that US households are spending so much - that's good, right? - that they have cut their savings rate to less that zero. Michael K Evans in Industry Week doesn't believe them. Because a respected authority says that this analysis is incorrect - Alan Greenspan in a working paper and the US Labor Deptment as well. For example, recently the Federal Reserve Board issued an important working paper, co-authored by none other than Alan Greenspan himself. It estimates "gross equity extraction" from homes on a quarterly basis from 1990 to the present. As I read through the numbers, they suggest that the personal savings rate is about 9%, not less than zero. They are not the only numbers we can look at. The U.S. Labor Department's Bureau of Labor Statistics publishes a comprehensive consumer expenditure survey on an annual basis. The personal saving rate, calculated from that survey, increased from 3% in 2000 to a whopping 12% in 2003, the latest year for which data are available. I don't think the saving rate is that high, but the point is that the BEA measure of personal saving is far from the only measure available, and in my opinion is irrelevant. Why the disparity? Because of different methods of looking at consumption, particularly housing. The main difference occurs in housing. Suppose, for example, that the typical mortgage rate declined from 7% to 5%, and many homeowners refinanced. They would then spend less on their mortgage payments, which would leave more money for either other purchases or an increase in saving. Note that this development is independent of the extraction of home equity, which increases the actual cash saving rate even more. The Fed's paper has gone far to resolve the conundrum that consumers keep buying other goods and services at the same rate even when energy prices rise and even though the personal saving rate is reportedly negative. The personal saving rate is nothing of the sort. It is probably about 10% when refinancing at lower rates and extraction of home equity are taken into account. I admit that this souce doesn't go into sufficient detail for me fully understand. But it appears that much of this is a conversion of savings in a home to cash savings by refinancing and extracting equity. But I do understand that two respected sources find the data say the news is good. As a result, real consumer spending will grow at the same rate in 2006 as it did in 2005. BEA will continue to report that the personal saving rate continues to become even more negative, but those figures can be safely ignored. A Man On A Big Mission ... Many will see changes in security--changes engineered by Hawley, who's now the head of TSA. Hawley was behind the recent decision to allow passengers to carry small scissors on board, but he's far from done. He has vowed to increase the variability of the screening process, increase intelligence gathering, and generally shake things up. In just five months at the helm, Hawley has acquired a host of admirers and an imposing group of critics. ... In a recent speech, Hawley said he was embracing more "flexible thinking" at TSA. Not everyone, however, is a fan of such thinking, or even agrees on what it is. And so Hawley's announcement that he was taking small scissors and tools off the list of prohibited items immediately drew fire from lawmakers like Sen. Hillary Rodham Clinton, who introduced a bill to reverse the changes. Unfazed, Hawley is pressing on. Now he wants to expand a program in which screeners monitor fliers for signs of agitation, like subtle facial tics, which might indicate a passenger is concealing a weapon or intends to cause some other kind of trouble. "Passengers with illegitimate, violent agendas don't act normally when passing through checkpoints," says Rafi Ron, a former security director at Israel's Ben-Gurion Airport, "if you know what to look for." Good for Hawley. The TSA will be able to search broader and be thorough when necessary. This also adds uncertainty: it makes it easy for terrorists when the routine is always followed. Give them some surprises and throw them off. We will be safer. President Bush is defending us against the 9/11 attackers - Al Qaeda. Who is against him? The New York Times and every Democrat that can be found. Telephone calls are tapped if they involve international terror group members or people they are in contact with. I am in favor of that. President Bush informed Congress. The New York Times lied and says Bush did it in secret. Ed at Captain's Quarter says "People have the impression that FISA requires warrants from the FISA judge, but that isn't what FISA says at all." Read it. 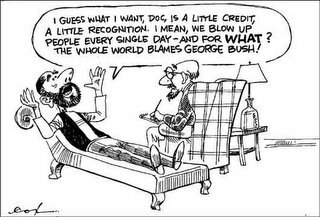 Powerline Blog is glad that "Bush noted both the legality of the NSA program and the illegality of the leaks that exposed the program to the terrorists." Why do we expect the NYT to not provide our enemies with tools to attack us? Low expectations. Now, a stilted calm prevails, a cover-up so carefully planned that the small town looks like a relic from the Cultural Revolution, as if the government had decided to re-educate the entire population. Banners hang everywhere, with slogans in big red characters proclaiming things like, "Stability is paramount" and "Don't trust instigators." Many facts remain unclear about the police crackdown on a Dongzhou demonstration on Dec. 6, which residents say ended in the deaths of 20 or more people, but one thing is certain: The government is doing everything possible to prevent witnesses' accounts of what happened from emerging. Residents of Dongzhou, a small town now cordoned off by heavy police roadblocks and patrols, said in scores of interviews on the telephone and with visitors that they had endured beatings, bribes and threats at the hands of security forces in the week and a half after their protest against the construction of a power plant was violently put down. Others said that the corpses of the dead had been withheld, apparently because they were so riddled with bullets that they would contradict the government's version of events. And there is a reward for telling the government's lie. 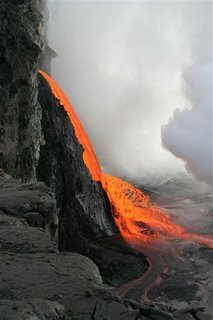 And residents have been warned that if they must explain the deaths of loved ones - many of whom were shot dead during a tense standoff with the police in which fireworks, blasting caps and crude gasoline bombs were thrown by the villagers - they should simply say their relatives were blown up by their own explosives. "Local officials are talking to families that had relatives killed in the incident, telling them that if they tell higher officials and outsiders that they died by accident, by explosives, while confronting the police, they must make it sound convincing," said one resident of the besieged town in an interview. "If the family members speak this way they are being promised 50,000 yuan ($6,193), and if not, they will be beaten and get nothing out of it." Should the world reward China with the spotlight of the 2008 Olypmics? It will be a spectacular show. But the show is being built on the deaths of - who's counting? - thousands of their own people. One historian is counting. 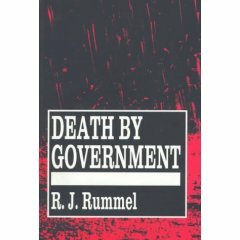 RJ Rummel at the University of Hawaii has spent decades counting "Deaths by Government." This does not count wars. He only counts when a country kills its own citizens. It is available at Amazon.com His website at U of Hawaii Freedom, Democracy, Peace; Power, Democide, and War covers the facts for quck reference. And I just discovered his blog "Democratic Peace." In a recent entry he updates the number of people the Communist government of China has killed: 77,000,000. This number does not include the actions of the previous governments. On December 6, 2005 the Communist government of China added at least 20 to the 77,000,000 of its own people it has killed. 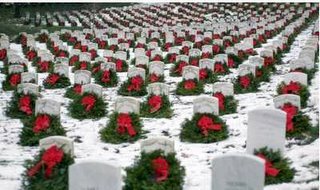 Note: "This exceeds the 61,911,000 murdered by the Soviet Union 1917-1987, with Hitler far behind at 20,946,000 wiped out 1933-1945. For perspective on Mao's most bloody rule, all wars 1900-1987 cost in combat dead 34,021,000 -- including WWI and II, Vietnam, Korea, and the Mexican and Russian Revolutions. Mao alone murdered over twice as many as were killed in combat in all these wars." Quoting Rummel's web site. Senate Majority Leader Bill Frist (R - Tenn) told reporters earlier this week that it is very doubtful whether Congress will pass a key tax cut bill before the Christmas holiday recess, as lawmakers rush to complete a number of other important legislative items before the year's end. The bill will contain a number of important tax cut items, such as an extension of the dividend and capital gains tax cuts beyond their present expiry date of December 31, 2008, and the renewal of various other tax incentives for businesses and individuals. However, because the House and Senate have yet to resolve differences in their respective bills, the legislation is unlikely to be enacted before February 2006. The delay means that lawmakers will be unable to apply a one-year patch to the Alternative Minimum Tax before the preset fix expires at the end of this year. Consequently, an additional 15 million Americans face being dragged into the AMT net in 2006, although Republicans have indicated that they will apply the patch retroactively to the beginning of 2006. Yes, 15 million tax payers will have their income taxes increased by the Alternate Minimum Tax. I hope they will succeed on the spending reduction they are working on. And keep control on throwing money at New Orleans. In the meantime, lawmakers are expected to turn their attention to a $45 billion deficit reduction bill and federal funding legislation. They are also likely to vote on a $7 billion tax incentive package designed to help the reconstruction effort in the areas of the Gulf Coast hit by Hurricanes Katrina and Rita earlier in the year. Trouble has arrived. Senior Ministry of Defence officials have confirmed to The Sunday Times of London that Britain is considering its options and contemplating a pullout from the multinational, multi-billion dollar F-35 Joint Strike Fighter program (JSF). It's a 10-nation program: USA, Britain, Australia, Canada, Denmark, Israel, Italy, Netherlands, Norway, Turkey); but Britain is the program's only Tier One partner with the USA. They've invested about $2B to develop the F-35B STOVL version that was intended to fly from Britain's future Queen Elizabeth Class carriers - and will also form the future backbone of US Marine Corps aviation. Come on, Congress. Fix it. BAGHDAD, Iraq - As Iraq moves toward crucial legislative elections Thursday, homegrown Iraqi insurgent groups are reaching out to the United States in the hope of launching a dialogue that would draw them into the political process and end their 2 1/2-year rebellion, according to U.S. officials and Iraqis close to the insurgency. Spurred by fears of the growing influence of Iran and encouraged by signals from Washington that the United States will start drawing down troops next year, insurgents who see themselves as fighting for an Iraqi nationalist cause are looking for ways to distance themselves from the religious radicals and the hard-core Baathists who have dominated the insurgency in the public eye, with a view to establishing a foothold in Iraq's political landscape, the Iraqis say. At the same time, U.S. officials also have indicated that they are willing to open a dialogue with people representing insurgent groups, as long as they have not been directly involved in violence. "We're not going to talk to people with blood on their hands," said Gen. George Casey, the commander of U.S. forces in Iraq, in a recent interview. "We talk to others who talk to them." A number of exploratory meetings have taken place between U.S. officials and people who claim to represent insurgent interests, Iraqis and Americans say, though there have been few tangible results. "They haven't got very far," said Casey. "There's too much mistrust." But the signals from both sides point to a building momentum toward negotiations that could help ease the violence as U.S. forces prepare to start reducing troops next year. Insurgents also have been reaching out to the Iraqi government. Since President Jalal Talabani told the National Reconciliation Conference in Cairo late last month that he was prepared to "listen" to "any armed group" that wanted to talk, his office has been contacted by a number of people who claim to be leaders of the insurgency offering to negotiate, his officials say. Read the whole thing! Great news! Police started firing into the crowd, killing as many as 10 people, mostly men, and wounding up to 20, villagers reached by telephone said Friday. On Saturday, Hong Kong's Apple Daily newspaper raised the death toll to nearly 20, citing villagers. There was no explanation for the discrepancy. Hong Kong's South China Morning Post newspaper today quoted villagers who said authorities were trying to conceal the deaths by offering families money to turn over bodies. "They offered us a sum but said we would have to give up the body," an unidentified relative of one slain villager, Wei Jin, 31, was quoted as saying. "We are not going to agree." It's not surprising that the government of China cannot handle dissent by its political process, because there are no political processes in China. The government is a Communist dictatorship. The dictator doesn't want to look bad in the eyes of the world. But he knows only one way to rule - by pure power. Should China be given the world's spotlight with the honor of hosting the Olympics? They can't even rule their own country. There is a solution, but it's messy - elections. If China were a democracy people would elect their leaders and would be able to have some influence over them. It's messy and it takes years to make the conversion. And the powerful have to give up their positions. In Russia they started this process, but the people at the top couldn't wait for the bottom and middle to build the political infrastructure, particularly since the end of Communism brought about huge economic disruptions. Cato Institute is a libertarian think tank that does first-class work. I am not a libertarian, but a conservative. I don't accept their whole world view, but it's close enough that I can use the work they do. Cato has a new combination magazine and blog: Cato Unbound - This issue's feature is a proposal to add 3 rights to the Bill of Rights in the US Constitution. First, Colin Hunt from the Canadian Nuclear Association dismissed the activist implication that the number of power plants needed to offset 5 GtCO2 of emissions cannot be built fast enough. "Building enough nuclear facilities to produce 25 GWs of additional power each year is equal to the construction worldwide in the 1970s and 1980s," he said. .... So what about the subsidy claims made by Matthes and other anti-nuclear activists? There are two parts to the subsidy question, first insurance. The discussion is too long to quote here. The industry insures itself in the US up to $10 billion per incident. There is a federal cap on liability payments. Maybe the greens are right that this cap provides an artificial support to the industry. The second part on subsidies is the disposing of nuclear waste. What about the claim that the government subsidizes the disposal of nuclear wastes? Here the activists are wrong. The nuclear industry people point out that taxpayers do not subsidize nuclear waste disposal; ratepayers do. The 1982 Nuclear Waste Policy Act requires electricity consumers to pay into the Nuclear Waste Fund a fee of one-tenth of a cent for every nuclear-generated kilowatt-hour of electricity consumed. That fund now totals $24 billion. It may be government mandated, but it is not government financed. James Glassman warns of 3 tax increases that will take effect automatically - without action of Congress - unless Congress acts soon. Capitalism Magazine Dividend tax requires action this month. Captial Gains tax requires action this month. Death tax aka Estate Tax can wait a month or two. Academic research has found that the dividend cut, by increasing what America's 57 million investing families can keep after taxes, boosted stock prices considerably. A paper for the prestigious National Bureau of Economic Research by Alan Auerbach and Kevin Hassett concluded that the cuts "had a significant impact on equity markets" -- a broadly positive impact. Take the cuts away, and stocks will almost certainly head in the opposite direction. The top Senate Democrat investigating Jack Abramoff's Indian lobbying met several times with the lobbyist's team and clients, held a fundraiser in Abramoff's arena skybox and arranged congressional help for one of the tribes, records show. Sen. Byron Dorgan (news, bio, voting record), D-N.D., acknowledges he got Congress in fall 2003 to press government regulators to decide, after decades of delay, whether the Mashpee Wampanoag tribe of Massachusetts deserved federal recognition. Dorgan met with the tribe's representatives and collected at least $11,500 in political donations from Abramoff partner Michael D. Smith, who was representing the Mashpee, around the time he helped craft the legislation, according to interviews and documents obtained by The Associated Press.